HCM CITY — Several recent large drug seizures in HCM City have raised concerns over the extent of drug crimes in the city, and the local administration is fighting back. On March 11, 26-year-old Nguyễn Hoàng Nam in HCM City went on a violent killing spree that claimed the lives of both his parents, his grandmother and his girlfriend’s grandmother, reportedly fueled by the girlfriend’s family’s disapproval of his criminal record and meth. Meth use by long-distance drivers also recently came to the forefront of public consciousness after a drugged driver ploughed through a crowd of people at a traffic intersection in Đà Lạt in March, luckily, there was no casualty, but the same could not be said about an accident in January that killed eight in Hải Dương Province, also by a driver on meth. Given HCM City has the largest number of drug addicts in the country — approximately 23,000 registered, making up 10 per cent of the country’s figure — there’s public demand for law enforcement agencies to handle these incidents. Dr Huỳnh Thanh Hiển from the HCM City Mental Health Hospital said the highs users get from crystal meth frequently involve delusions and aggression. Long-term abuse can alter the user’s personality, as well as damage the body and cognitive functions. Hiển also cautioned against a common misconception among the community that crystal meth is not as addictive as heroin or can be used to relieve dependence from the opioid, which often leads to double addictions. According to law enforcement agencies, drug trafficking has become a complicated matter as aside from traditional delivery methods, the ease of making purchases of these illegal substances online via social media have contributed to the rise of drug uses, thwarting authorities’ attempts to curb addiction. Characterising drugs as “the mother of all crimes,” Minister of Public Security Tô Lâm said attempts to reduce crimes would be for naught if drug crimes were not contained. Nguyễn Hữu Nghiệp, deputy head of the city’s customs department, said traffickers have taken advantage of the city’s policies aiming at easing customs procedures, especially automatic electronic declarations, to sneak drugs in and out of the country – usually by inserting drugs into the sleeves or linings of goods’ packages like CDs holders, computers’ hard disk drives, or vacuum cleaners. 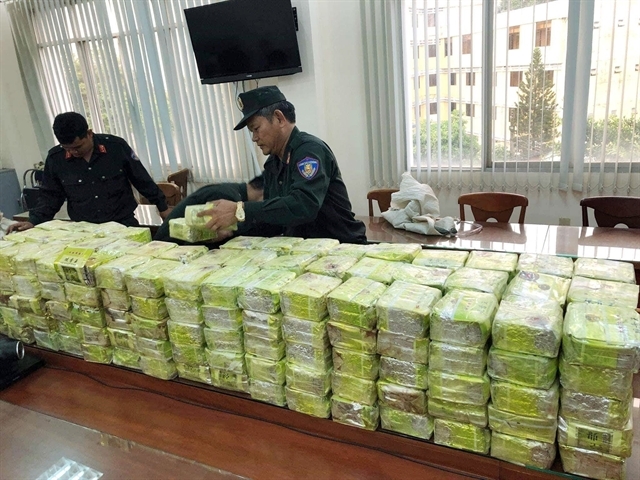 HCM City Customs in recent times has made large-scale drug seizures from the US, Canada and some European countries that were brought to Việt Nam via airways, post or express delivery services, Nghiệp said, adding that from the beginning of 2018, the customs department also took notice of the rise in the trafficking of MDMA, or ecstasy. Aside from crackdowns on trans-provincial and trans-national drug rings, local authorities are also working to curb demand from the city’s drug addicts. Lê Đông Phong, Director of the city’s police, said a preliminary survey of addicts in the city showed 80-90 per cent of them tested positive to drugs not on the authorities’ list of banned substances, necessitating a survey of addicts for appropriate preventive measures.